You are here: Home / Jyotish Gemstones and Talismans / Internally Flawless Yellow Sapphire from Ceylon! What is exactly meant by an Internally Flawless Gemstone? Internally Flawless Yellow Sapphire from Ceylon! What is exactly meant by an Internally Flawless Gemstone? Internally Flawless Yellow Sapphire from Ceylon!. What is exactly meant by an Internally Flawless Gemstone? Comments A gift from the Lap of Mother Nature!. An Internally Flawless Unheated Ceylon Yellow Sapphire. Lovely Golden Yellow Color, Eye clean clarity, superb lustre and you have a Vedic Astrology Gemstone– A True Jyotish Gem for the blessings of Jupiter.What exactly is an Internally Flawless Gemstone? In Gemological terms an internally flawless Gemstone means that the gemstone is virtually inclusion free! This phenomena is very rare when it comes to natural gemstones that do not have any treatment. And, When you have one like that you have a Gem that can be classified as Internally Flawless. 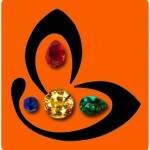 This happens only in around 1% of all Natural Gemstones and these Gemstones come at a premium. In addition to an internally flawless structure if the Gem excels on the parameters of cut, color, clarity and carat weight it reaches the apex of the Gemstone Pyramid and further gets classified as Premium Gem Quality or Premium Jewellery grade gem and is selected for fine and precious Jewellery. An excellent finished Gold ring accentuates the beauty and the panache of this fine Yellow Sapphire. It is Gems like the one featured above which bring about peace, prosperity, solutions which can be collectively called as Good Luck. It is what exactly Jyotish Quality Gems are all about. 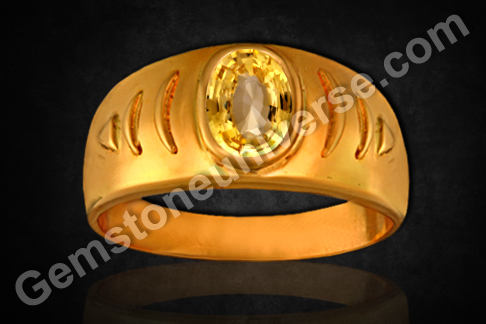 Gemstone Ring Yellow Sapphire for Jupiter is really nice design. We offer complete jewellery manufacturing solutions, we have large collection of gold, silver as well as Antique jewellery.